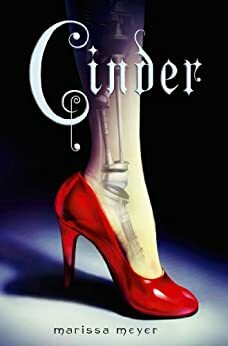 “Cinderella is a cyborg in this futuristic take on the fairy tale, the first book in Ms. Meyer's planned 'Lunar Chronicles' series.” ―Wall Street Journal, in a round-up called "After Harry Potter: The Search for the Magic Formula"
5.0 out of 5 starsEverything I could have hoped for. Oh my goodness this book. I debated between a 4 or 5 star rating, but this is honestly one of the most exciting books I've read this year, and the fact that I sat down and read the whole thing in less than 24 hours is a huge plus. The truth is, the cover is what initially made me grab this book. I thought it was beautiful. But then I read the synopsis and I'm thinking "okay future Beijing, plague, cyborgs, aliens, and Cinderella? How is this going to work without being ridiculous?" But Meyer totally pulls it off. The characters were interesting, the story kept me reading straight on through for hours. The modern take on a classic story was refreshing without being cliche. Cinder was a strong main character who kept me rooting for her. I am so thankful I bought all the books out so far because I've jumped right into Scarlet. This series is something new. It's a refreshing thing to read, especially in Young Adult fiction. I am so pleasantly surprised by this book. I’m a little late to the game with this, as I was a little hesitant to read Cinder by Marissa Meyer. I really like this trend of reimagining fairy tales, but I was worried this would just regurgitate the Cinderella story without really any extra creativity. But a bunch of my friends really enjoyed the series so I thought I’d give it a try. I was really disappointed by page 50, when I saw the entire story laid out for me already. Part ​of​ me wanted to call it quits, I hate catching on to things so quickly, but I did like the android component and the angle that Meyer came at the familiar story, so I pressed on. ​For a familiar fairy tale, Cinder actually stood apart from the Cinderella story. All the important elements are there (a prince, a ball, an evil step mother etc. ), but ​​surrounding these events is very much an original sci-fi​ story that is, sadly, predictable but is also completely enjoyable despite that. The characters are strong, the story flows well, I read this really quickly and easily. If you’re looking for a light and fun read, this will do you well. It’s just one of those books that are pure and solid entertainment and I can’t wait to read the rest. Oh My gosh. I haven't fangirled in a while about a book. I have definitely been fangirling about this one. Cinder borrows elements from Cinderella obviously. She is a poor girl who abused by her step mom but then meets the prince. SPOILER ALERT - People are dying from a mysterious disease so that's how the basic plot starts out (how do they stop people from dying).END ALERT. Lots of twists on the beautiful classic tale. And guess what, the villain isn't who you think it's gonna be. No...they're someone much more colder. 3.0 out of 5 starsA bit predictable. I enjoyed this first book of the series. It's written for a younger (teen) reader but I did like it (and am certainly not in the "teen" category) and I will look at purchasing the next one in the series. I would recommend for some enjoyable, if a bit predictable, reading. It was pretty easy to predict what was going to happen and some of the key "gotchas" ahead of time but I didn't mind so much because it was fun. I loved this book! It was so creative, funny and such a unique twist. plus it was fast paced. I am not huge on the sci fi genre but this book was excellent because it was part fairy tale, sci fi and dystopian! by far one of the best books I have read! This was a fun read. I enjoyed the main character Cinder, and felt sympathetic toward her trials. It was a nice twist to the traditional story, and I am left wanting to know more about this world.